Perhaps one of the best ways to explore Prince Edward Island is via the Confederation Trail. Following what was once the railway line, the trail stretches from tip to tip of the island, through forests, wetlands, villages and waterways, for 173 miles (279km). The trail is almost entirely flat, and has a finely crushed gravel surface, making it easy going; perfect for walkers, cyclists and those in wheelchairs. 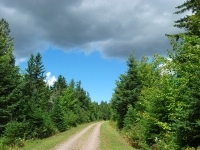 In winter, the trail is a favourite with snowmobilers and provides a picturesque route through the province, from Tignish to Elmira. Visitors can enjoy the natural splendour of the island, including its lush flora and abundant fauna, and experience its peace and tranquillity at a pedestrian pace. Entry points to the trail are marked by distinctive plum coloured gates, and the less adventurous can choose to follow the trail for some of the way and stop off to rest and grab a bite in one of the many villages connected by the trail.